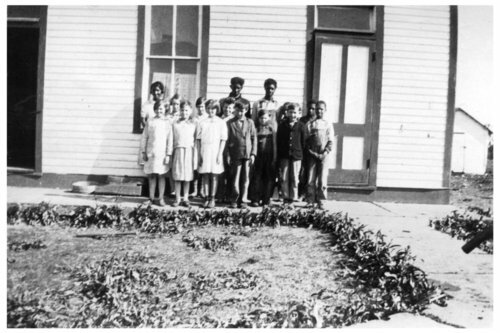 Photograph of a group of students from Bradford School District No. 27 in Wabaunsee County, Kansas. Some of the children have been identified as Elsie Shaw and Billy Ford, as well as two Scott children, four DePriest children, two Prescott children, two Robbins children, two McKnight children, and _____ Smith.